We do our best to limit our use of paper whenever possible. Receiving your bank statements electronically is a great way to save paper and other resources. It is also a good way to help protect your private financial information. Did you know that the majority of ID theft today occurs as a result of someone intercepting your traditional mail or by someone accessing your improperly discarded documents! In addition to securely disposing of your private financial records, receiving your bank statements electronically will help reduce your risk of becoming yet another victim of this all-too-common crime. Once you sign up, you will have access to 12 months of statements online in which you can print or download for safekeeping. At First Commerce Bank, we realize the impact we can have on our environment, and we do our best to limit our use of paper and other consumables whenever possible. We have invested considerable resources in technology and are striving to become more "paperless" in our day-to-day processing. 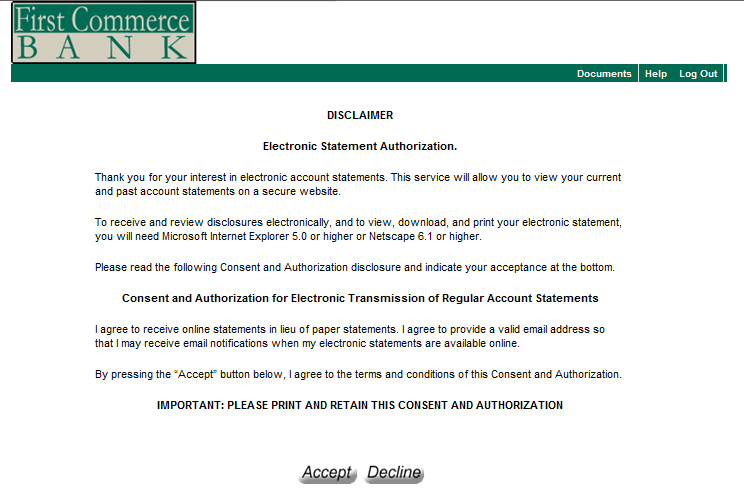 We hope you will consider banking electronically whenever possible. Please follow the short few steps below and you will be “Paperless”! *Note: You must be an Online Banking Customer to retrieve statements electronically. 1. 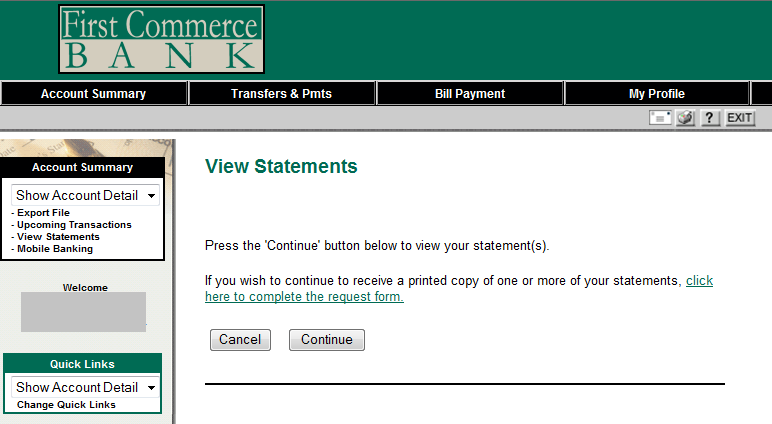 Log into Online Banking, hover over Account Summary and then click Statements. 3. A new window may open, Read the Electronic Statement Authorization Disclaimer and click Accept. 4. Your accounts will be displayed from which you can bring up your statements by clicking the word Statements for each account. That easy!